Justin Bieber went off on a woman at a gym in North Carolina Tuesday ... mocking her workout, cussing at her ... and possibly even spitting in her water bottle ... so claims the woman -- but Justin's peeps say it's all BS. The woman behind the accusations is Colette Harrington -- a NC radio host who claims she was minding her own business, working out at the gym at the Ritz-Carlton Hotel. According to Colette, Bieber -- who had a concert in Charlotte on Tuesday -- strolled into the gym with two other people -- one appeared to be his trainer and the other appeared to be a backup dancer or singer. Colette says she approached Bieber and asked for a picture, but JB said no. She says she continued working out, but then heard Justin and his posse mocking her workout routine. Colette explains, "I always count out loud my reps. Then Justin starts imitating me and whenever I'd get to 20 he and his buddy would say 'Shut the F'ck up.'" Colette says she ignored the group -- but claims they continued to mock her as she counted out her reps.
Then, according to Colette, someone ... and she thinks it was Bieber or someone in his group ... 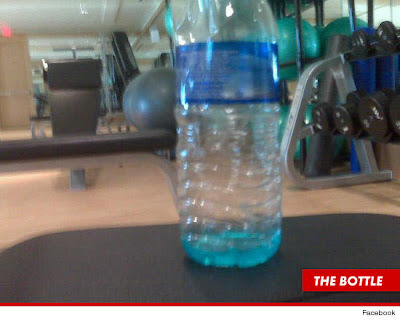 SPIT blue Gatorade into her water bottle while she wasn't looking ... and she actually DRANK the spit-orade. "I did not look at my water bottle before taking a drink." Colette says she filed a complaint with the hotel after the alleged incident. We reached out to the hotel, but they wouldn't confirm or deny her story. Now, Colette says she's going to sell the spit-filled water bottle on eBay and plans to use the money to upgrade the kitchen at her local Ronald McDonald house, where she volunteers. Bieber's rep tells us .... the woman is dead wrong. Justin and his trainer were in the gym, and they were making snide comments to EACH OTHER but absolutely NONE were directed at the woman.